Try packaging healthy snacks in cool containers. Bento boxes are always fun and now there are many variations available in department stores. Have your child make their snacks. If he makes the food, he may be more interested in eating it. Try buying him a cookbook so he can pick his own recipes. Decorate your fruits. Fruits satisfy the craving for sweets but provide more vitamins and nutrients than sugary snacks. If a plain piece of fruit is unappealing, try fruit kabobs. You can even use a sharp potato peeler to make long strips of melon. Roll the melon strips like sushi and dip in a yogurt sauce. Make fruit juice popsicles. To make interesting popsicles, try adding berries inside the juice or layer the juice with yogurt. You can even layer yogurt, granola and fruit to make breakfast popsicles. Make kale chips. Toss kale with olive oil and salt. Cook at 275° until brown. Kale chips are much healthier than packaged potato or corn chips. Make bean and rice quesadillas for a hearty snack. Experiment with different salsas to add variety. Keep hard-boiled eggs in your refrigerator for quick snacks. Try decorating the shells like Easter eggs to make them pretty. Keep carrot sticks available. Cut the carrots and put them in a glass of water in the refrigerator. The water keeps them especially fresh and crisp. Use hummus for dipping chips or vegetables. Drink fruit smoothies. For extra energy, add a scoop of protein powder. Buy curly straws for even more fun. Go classic with ants-on-a-log. 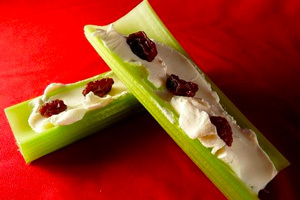 Many kids love the celery, peanut butter and raisin combination. Bake homemade sweet potato chips. Toss sweet potato wedges with olive oil and salt. Bake at 425° for 20-25 minutes. For extra flavor, add some chili powder. Serve fruit salad in an ice cream cone. Make melon balls. Better yet, have your kids make melon balls. Then use the melon rind as a bowl for yogurt. Make homemade fruit leather. Cut the leather with a cookie cutter to make shapes. Making your snacks fun and interesting may get your child interested in eating them. Sometimes presentation is all that matters. However, strong junk food cravings can be a sign of imbalance. If your child craves one type of food over another, I recommend an acupuncture tune-up. Give me a call to schedule an appointment. This article was posted in Acupuncture, Nutrition and tagged diet, food, healthy snacks, kids. Bookmark the permalink. Follow comments with the RSS feed for this post. Both comments and trackbacks are closed.